Show and Tell Meg: Redbox: 2 Free Rental Codes! Redbox: 2 Free Rental Codes! 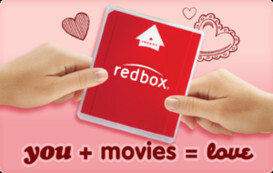 Redbox is offering not one but TWO free rental codes for Valentine's Day :) Both of the codes are good today only, but you can use each of them to get a fun flick for your date night - whether it's with a significant other or a pint of Ben and Jerry's :). Just go to the kiosk, select your movie and enter one of these codes to get it Free! You will have to do these as 2 separate transactions and they have to be returned tomorrow by 9pm to avoid a charge.